It’s been a while since I posted anything in my little DIY series, How to…, like me previous post about How to… reset a Levin neck or remove a bridge. I did carve a little floating bridge for my Levin 65 over a year ago but now it was finally time to carve a proper ebony bridge for my K. Yairi YW-1000. 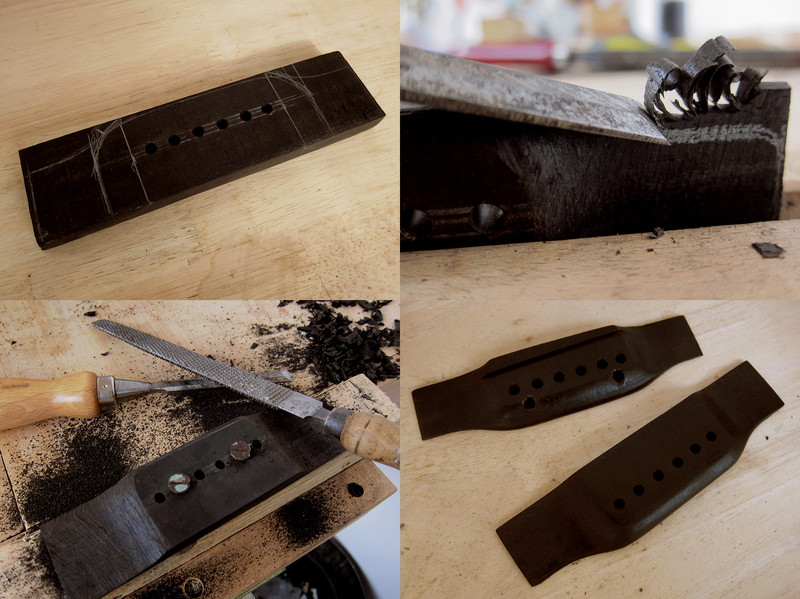 I thought about getting a pre-made Allparts ebony bridge at first but felt that it would be more fun to make one myself from scratch instead. I ordered some rosewood and ebony blanks from Madinter, it thought it could be good to have some extra at home, and got started. First I removed the old bridge, it had two screws that was a bit tricky to get out but eventually I figured it out. I removed the bridge with a spatula that I heated on a normal clothes iron, it works like a charm every time. Start in a corner and work yourself towards the middle and be careful when it starts to loosen up so you don’t break it off and chip the top, it should come off slowly and without force. I planed the ebony blank and then used a cabinet scraper to get it even. I copied the old bridge and drilled the holes straight away. It felt easier to do this before the bridge was shaped, it would also have saved me a lot of time in case I messed up the holes and had to start all over again. Luckily everything went fine. Once the bridge was sawed in to a good size, I made it a couple of millimetres bigger on all sides, I drew the outlines of the final shape. I mounted the bridge blank on a piece of scrap wood with two screws so I could more easily work all around with the bridge firmly secured. I used a chisel to carve out the shape on the sides and from the top down towards the wings. I got a good round shape with a half round rasp and then it was just a hell of a lot of sanding to remove all the lines from the rasp and to get it smooth and nice. I glued the bridge on and after 3 days I strung up both E-strings and used a drill as a saddle so I could move it around until I got the intonation right, I forgot to take a picture of that. I marked out the saddle and then sawed a 3 mm slot. Next step was to create a bone saddle to match and string it up. Easy peasy, well it was a hard days work but it was easier that I thought.